So finally it was a girls night out yesterday. after long boring discussions and cancellations and 50+ email chains, the Ladies of my group decided to have a short night out without kiddies and their Daddies.. We planned to watch the movie ” Ice Age 4 – 3D”. Everyone rushed to the theater after Office and grouped on time for the show. Movie started with the usual nutty squirrel ( known as Scrat , see here for introduction ) and the took us over with yet another engaging journey of Ice Age Saga.. I have to admit that some of the scenes were absolutely hilarious and the characters have been kept as funny as they used to be, especially Sid (and his incredible grandmother)…. You smile a lot, you laugh sometimes, but certainly not during the whole movie. The film is fast and fun and carries excellent messages of the importance of family and the importance of being yourself. A bunch of new characters freshen up the film, with a band of pirates, including a love interest for Diego. And I was all the more excited to know that Jennifer Lopez has lent her voice to Shira, the new female character in the Ice-Age family… In a nut shell, for all you Ice Age lovers, its a must watch. 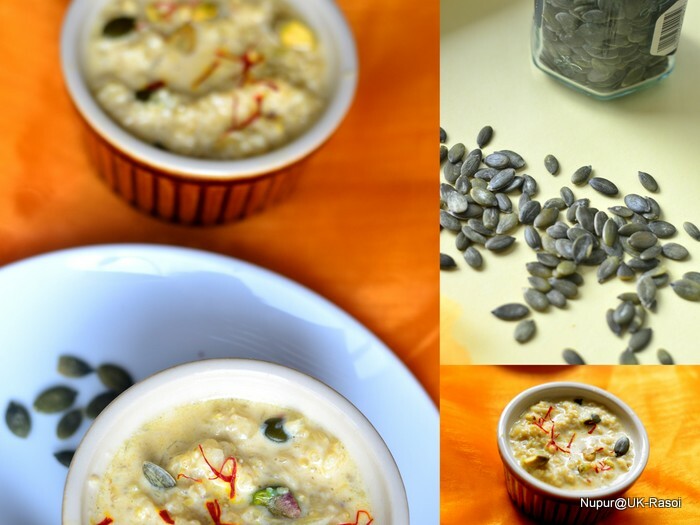 Coming back to the recipe for today – Bottle Guard kheer with Quinoa. I have had my share of disasters experimenting with Quinoa. But this is the one I would want to cook again and again. Oozing up with the tremendous nutritional benefits of Bottle Guard and “Complete Protein” of Quinoa, this dessert can be made very frequently. And the addition of Pumpkin Seeds enhances the taste and nutrition even more. Squeeze grated Bottle Guard and keep aside. You can use the leftover water for kneading the dough or in your Curry Base. Heat ghee in a pan, add squeezed Bottle Guard and saute for 5-7 minute on medium flame till the water gets evaporated and it start giving off fragrance. Add Quinoa and mix very well. Add milk and sugar simmer on low flame for 20-25 minutes. Alternatively, you can pressure cook till one whistle and then simmer for 10 minutes to make it thick. Add Pistachios and Pumpkin Seeds and just before turning off the flame add Saffron+Milk and stir to mix. 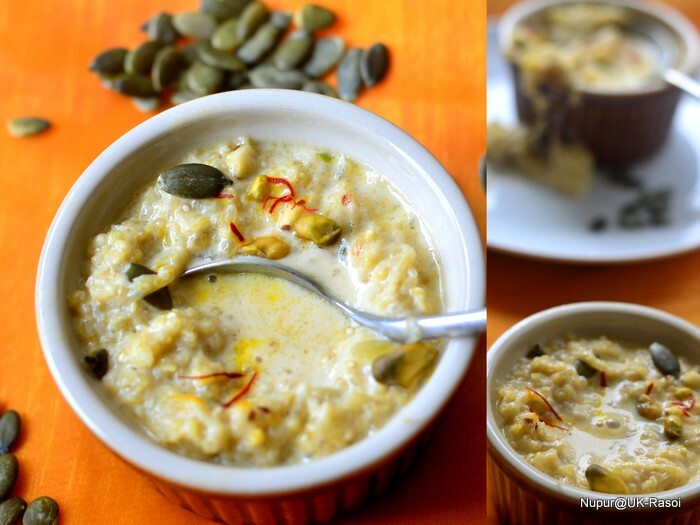 This Kheer is very rich and Fiber and Protein and hence will be a filling dessert. Take care not have this after a heavy meal. You can reduce the quantity of Quinoa, even can omit it and make plain with Bottle Guard. In that case, reduce the quantity of milk to give creamy texture. You can even use Condensed Milk and adjust the milk and sugar for desired consistency. How innovative and healthy, makes it a guilt free dessert! loved the addition of quinoa and pumpkin seeds!! very healthy and delicious kheer..nice innovation dear! love ice age 4 and this kheer recipe too. such a creamy consistency. love it. Loved watching Ice Age 4 with my Father in Law and 5 year old son….That Granny’s character was hilarious….The kheer looks so creamy and new to me. Quinoa and bottlegourd together in kheer, thats truly unique and irresistible. Very healthy and delicious kheer.. The Kheer looks delicious. I have never cooked with bottle gourd or Quinoa but will certainly try this recipe. I am only person in my family who enjoys bottle gourd desserts! And am glad you came up with this innovative one..will try this. That’s a pretty interesting dessert. The combination of veggie and grain you used is something I never tried before but definitely inspired!